So I ran/walked a 5k this weekend. That’s me on the left and the cute blond next to me is my best-friend-since-sixth-grade Kelly. I mention the 5k for a few reasons. First of all, it was lots of fun because it meant Kel was in town with her family, including her sweet mom who I don’t get to see nearly often enough! 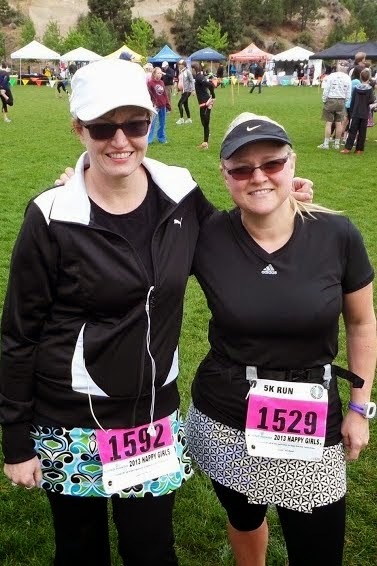 Also, the race itself was cool because it was the all-female Happy Girls Run and the whole vibe was really positive. And, lastly, I mention it because I kind of shocked myself by running more of it than I walked! 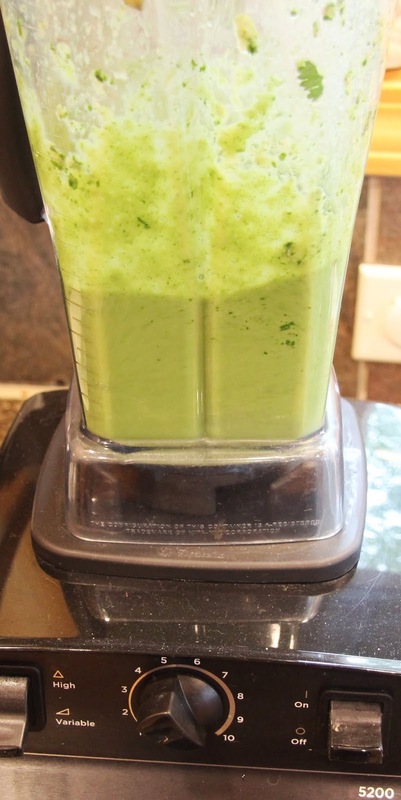 This is a dressing I will end up making over and over again this summer. It’s full of fresh flavor, has a nice creamy texture and goes well with all kinds of grilled entrees. We had it in a slaw type salad (not pictured) with my husband’s awesome smoked ribs this weekend and it was a huge hit. The slaw/salad was actually the prepackaged Eat Smart Kale Salad from Costco that has kale, Brussels sprouts, cabbage, pumpkin seeds and dried cranberries in it. I just substituted my dressing for the sweet poppy seed dressing that I don’t like (Okay, I’ve actually never tried it. I like to make my own dressing!) in the package. So easy, so good and such a healthy side dish! I can’t tell you how necessary that was with all the chips, cookies, ice cream (and did I mention ribs??) we ate over the long weekend. Our best friends were here and we were in a very celebratory mood! 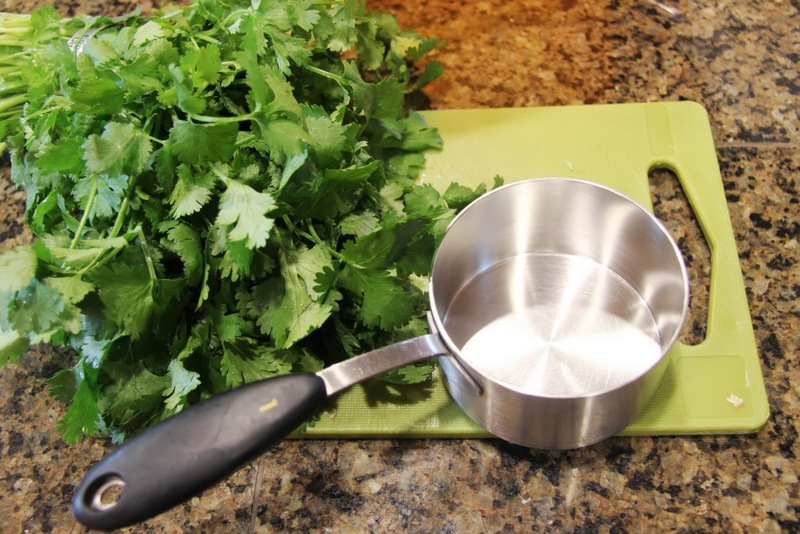 Wash and drain a medium bunch of cilantro. 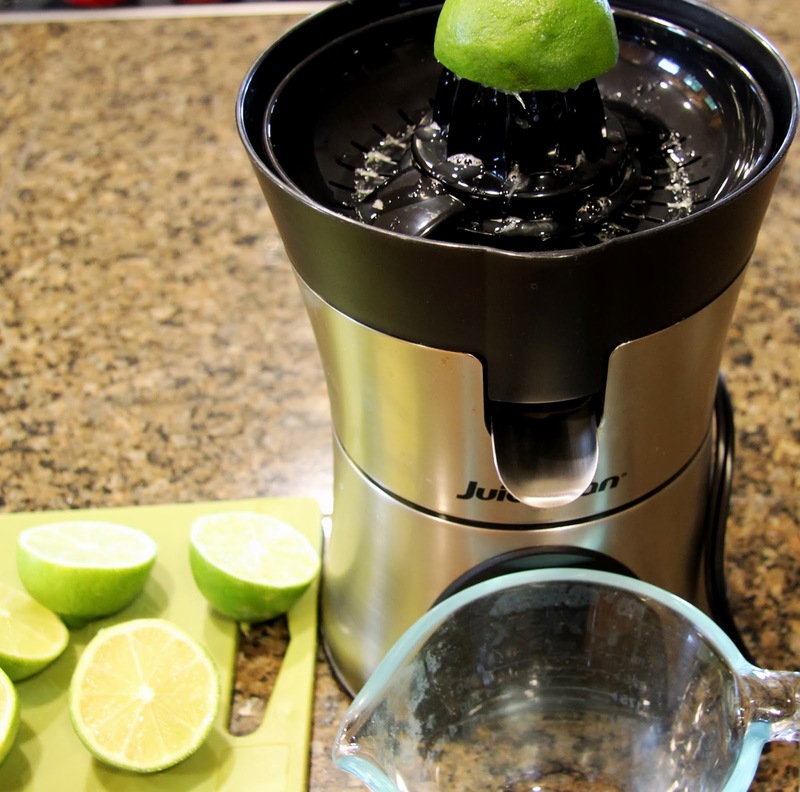 Juice about 4 limes to yield 1/2 cup juice. 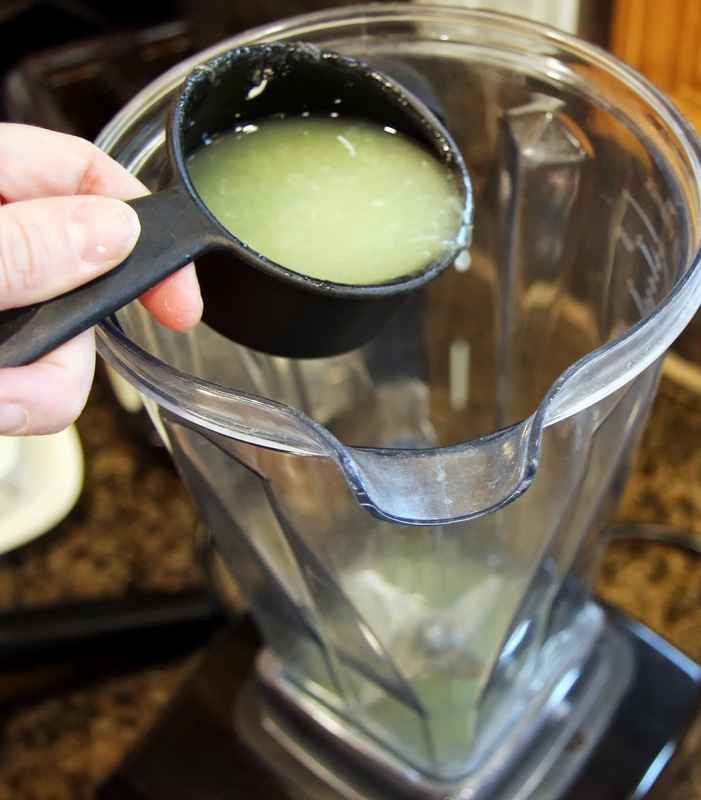 Place juice in the bowl of a blender or food processor (a good immersion blender would also work). 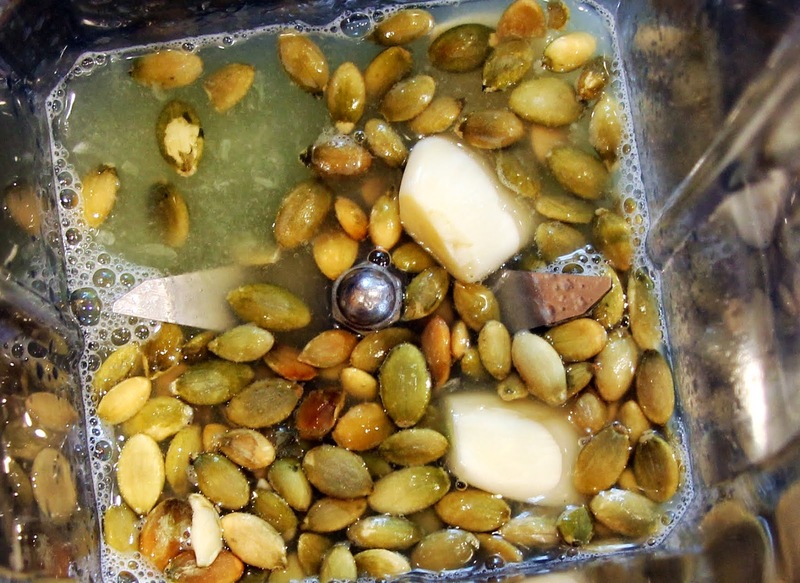 Add roasted pepitas. I buy mine pre-roasted at the grocery store. They call them pumpkin seeds but I think the Spanish term “pepitas” is much cuter. Peel and add two cloves of garlic. 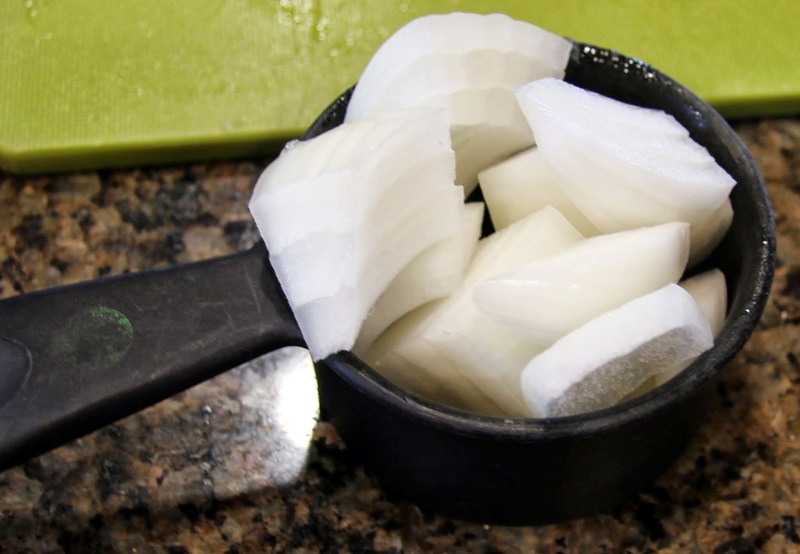 Chop large, sweet onion into quarters then chop 1/4 of it into large chunks. It should be about 1/2 cup. 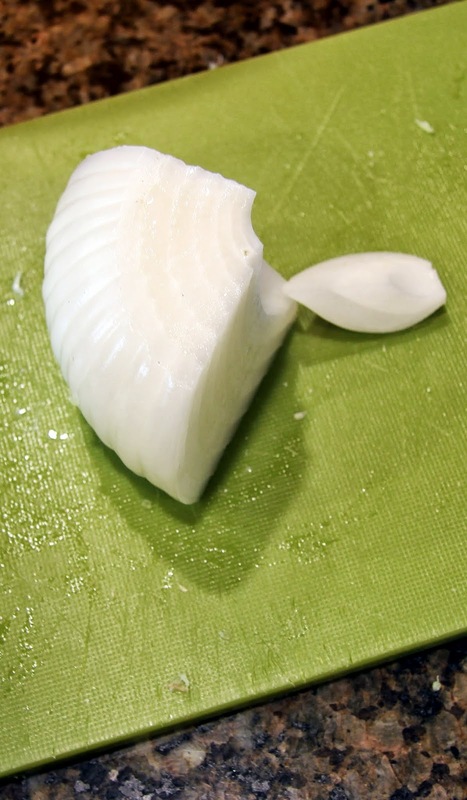 Reserve the remaining 3/4 onion for another use. 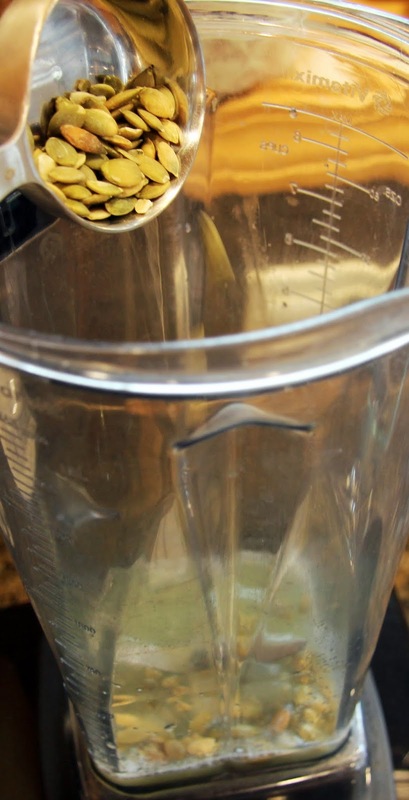 Add onion to the blender along with cumin. 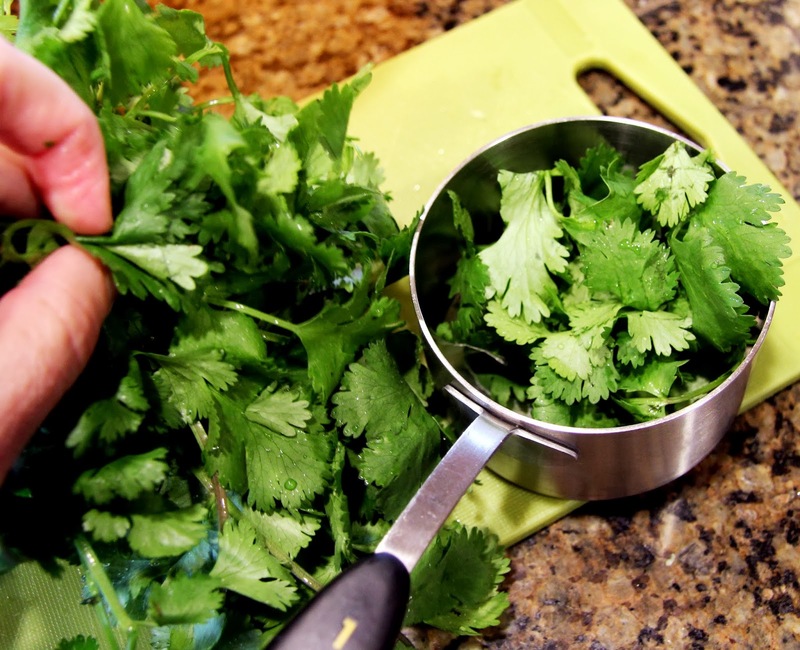 Pick leaves off cleaned dry cilantro until you fill a measuring cup, packing it in firmly. 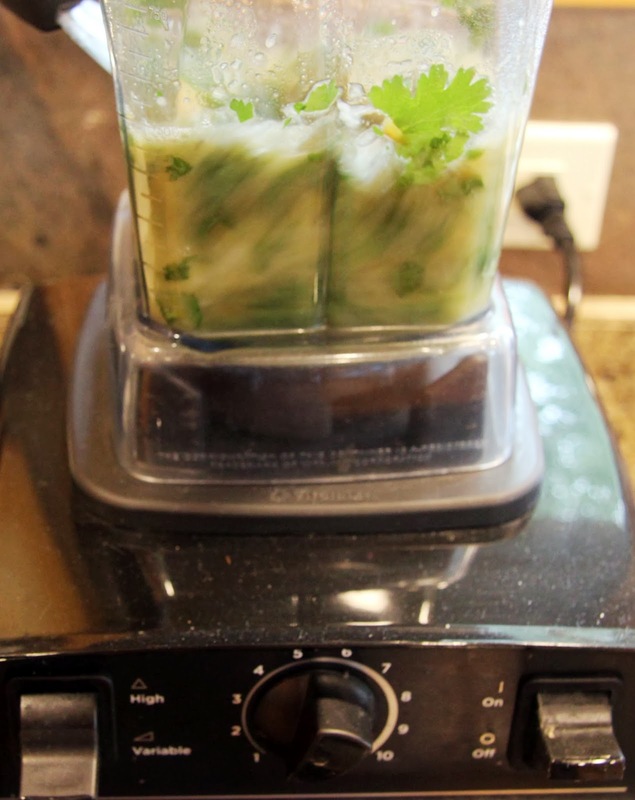 Don’t worry if you have some stems along with the leaves, they’ll blend up well. Add salsa and hot sauce. 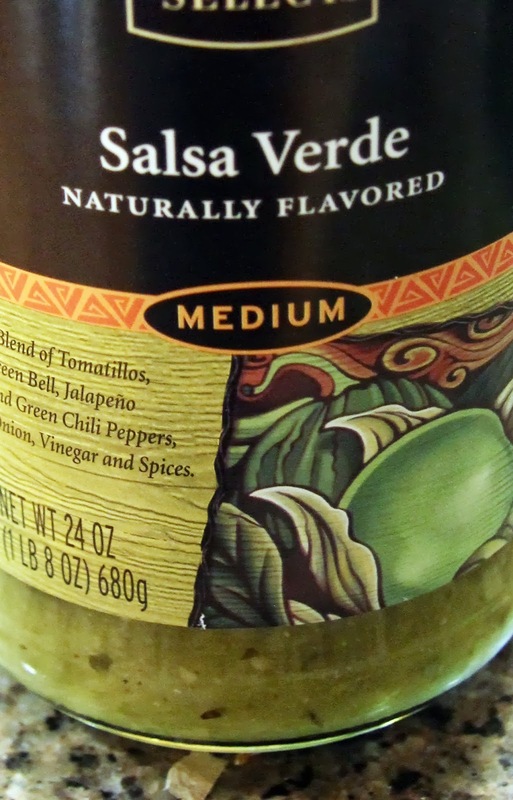 If you don’t have salsa verde, no worries, just add a little more hot sauce if you want more heat. Also add agave nectar or honey, salt and pepper. 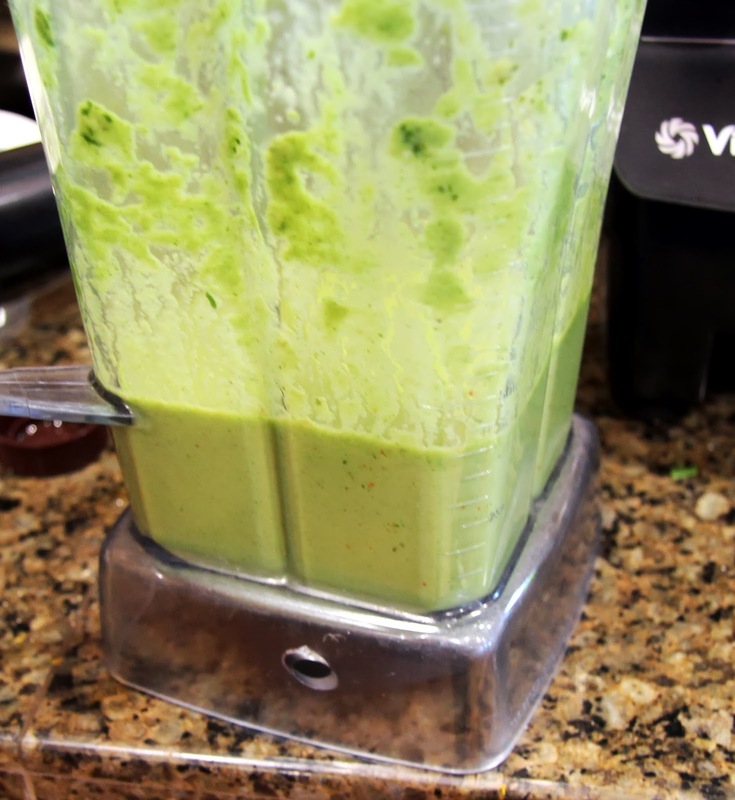 Blend until completely smooth starting at low speed and working up to high. 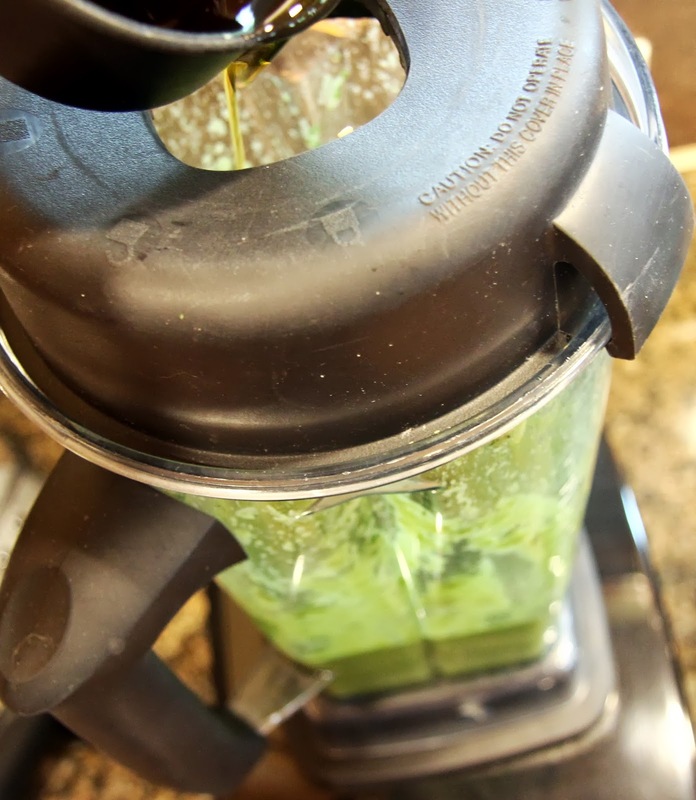 Reduce speed to low and add olive oil. 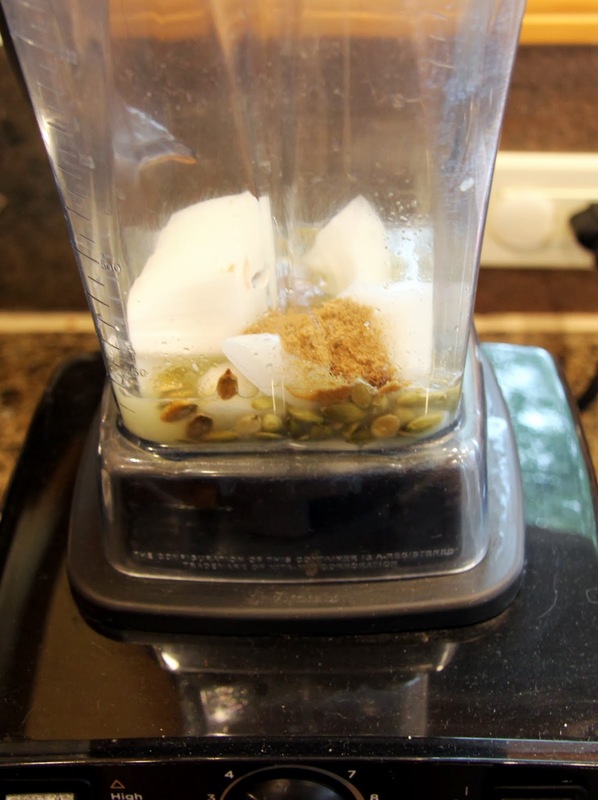 Blend until smooth, gradually increasing the speed to high. This shouldn’t take long. 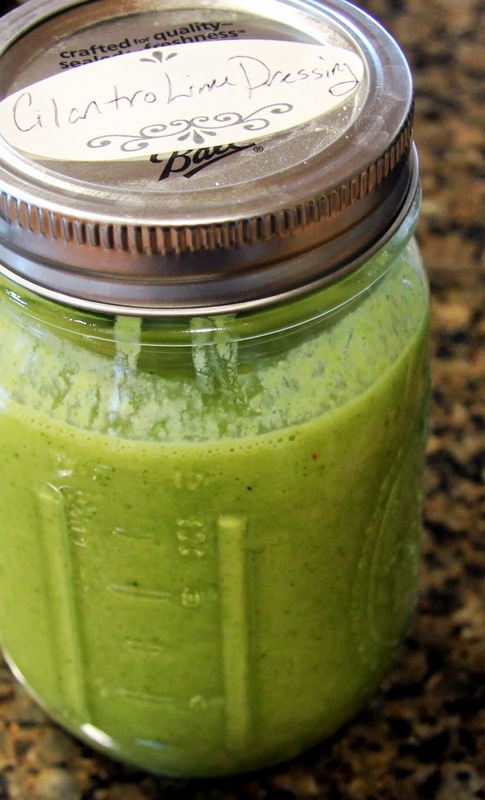 Refrigerate and store in a jar or container until you’re ready to dress! Use within 3 – 4 days. 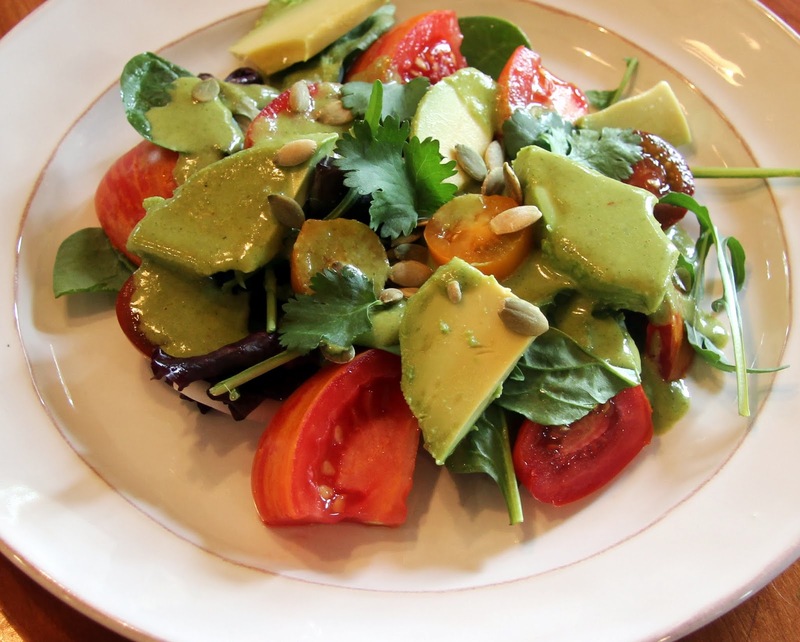 I used it on this simple salad of mixed greens, tomatoes, and avocado and it was delicious. It was even better two days later on the kale/Brussels sprout/cabbage slaw! I’m thinking about trying a potato salad with it next time… Anyway, enjoy!